Murex takes the top spot in this year’s rankings, as banks’ technology needs inspire more collaborative approaches. Over the past few years, banks have been coming to terms with the fact that much of their capital markets and other technology is no longer fit for purpose. Individual systems do not have the functionality or performance to meet current regulatory or business requirements, while the infrastructure as a whole is inconsistent, inefficient, inflexible and far too costly. Many banks already have infrastructure upgrades underway, but at the same time are having to meet a barrage of regulatory deadlines. Some of these deadlines make new demands of the banks’ systems, while others go far beyond that, with implications for computing power, data and governance. In the latter camp, vendors give the example of new rules on market risk capital – the Fundamental review of the trading book (FRTB) – and revamped loan-loss accounting standards. “Implementing FRTB is not something a bank can do by just buying a component and sticking it on top of its existing setup. 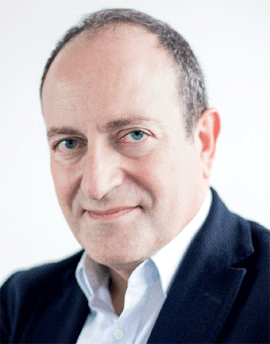 You have to redesign your capital markets infrastructure,” says Maroun Edde, chief executive officer of Murex, who is based in Paris. 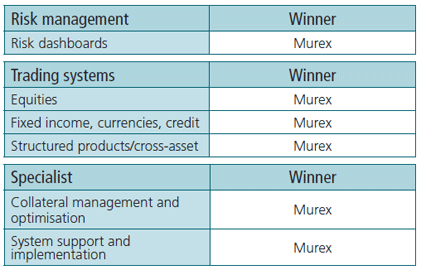 Murex once again topped the Risk technology vendor rankings, dominating the trading systems categories and scoring consistently well across many others. Banks are responding to these parallel demands – the immediate need for regulatory compliance and their own longer-term strategic goals – by asking more of vendors. New projects need to resolve multiple needs, rather than being pursued in isolation. “Our new projects are more than twice as big as they were a few years ago,” says Edde. The scale of the work is hinted at in the survey that accompanied this year’s Risk technology rankings. Sixty per cent of the 608 financialinstitutions that responded to the question said they planned to increase their technology spending in 2017, with almost 23% of those respondents anticipating a spending increase of a fifth or more. Obsolete systems, support for growth plans and regulatory compliance are the main drivers of their increased spending. Like FRTB, loan-loss accounting – in the form of International Financial Reporting Standard (IFRS) 9 – has implications that stretch beyond the immediate requirements, but where there is even greater urgency because of the looming January 2018 implementation deadline. The new rules change the way credit losses, or impairments, on certain financial assets, such as loans and debt securities, are recognised. The calculation of impairments is currently based on incurred losses, but the new standard introduces an expected loss model with varying time horizons – in some cases calling for the loss forecast to span the entire life of the loan. A fundamental part of meeting the requirements of IFRS 9, as with FRTB and other new regulations, is the gathering, cleaning and managing of the relevant data. The centrality of comprehensive, high-quality data to the risk management process has been recognised by the Basel Committee on Banking Supervision and addressed in its rule 239, Principles for effective risk data aggregation and risk reporting. The biggest banks were supposed to be in conformance with the principles from the start of 2016, but many still have work to do – medium-sized banks are also wrestling with its layers of change. The scale of the data challenge was made clear by the participants in this year’s survey, with nearly 50% saying it would take up to two years to raise their data quality and aggregation capabilities to the level required by the regulators, with a further 14% saying it could take up to four years. The accumulating regulatory and business demands, culminating in the onerous requirements of the FRTB and IFRS 9, are reshaping relationships with banks, say vendors. Although the competition among vendors for contracts remains fierce, once the bank has selected a provider, the discussion is very different from how it was in the past. No longer does it turn primarily on price and delivery date, but is more far-reaching and open-ended. “Banks realise the transformation they are trying to go through, which is technical, organisational and functional, is not something they can do alone. They don’t have all the necessary elements. They don’t know what is being done elsewhere. They cannot build all the required functionality.They need others who can pick up a significant portion of the load,” says Murex’s Edde. But the vendors also recognise they don’t have all the answers, or the resources – in many cases, they are calling in additional support. Consultancies and systems integrators have always been part of the technology process, the former often engaged in the project scoping and systems selection, the latter carrying out the implementations. The scale and complexity of current projects means the consultancies and integrators are becoming more integral to the whole process. “When a bank comes to us with a programme to change 30 years of legacy systems and implement an integrated platform – and do it in five years – it is so far-reaching that we need help from specialised integrators who understand our tools and methodologies and who can work with us from end to end in the bank,” says Murex’s Edde. These longer-term and more open-ended engagements with banks are also affecting how vendors price contracts. “You need commercial arrangements to reflect the fact you are not just selling software and then moving on. During the life of the transformation project, the bank and the vendor are intertwined. We have to be able to correlate some of our revenue with the success of the project. It is necessary because some of the projects are so complicated that the bank and vendor must be totally aligned,” says Murex’s Edde. The good news in all this is that while banks have been wrestling with their regulatory and infrastructure demons, developers have been driving technology forwards. Nowadays, IT infrastructure is conceptualised as a stack, with layers of component technologies that interact to perform a given task, from hardware up through operating system, data management, processing engines, applications and user interface. Vendors point to rapidly advancing technologies at every level of the stack that are bringing significant benefits in scalability, performance, security and reliability. This includes in-memory data handling and non-relational databases, new programming languages and graphics processing units for parallel processing, cloud computing and web-based microservices. The ability for vendors to exploit these advances is becoming critical to their competitive standing. Like the banks, vendors are having to transform their technology, with those that grasped the nettle earliest now reaping the rewards. First published on Risk.net. Reporting by Clive Davidson. Research for this year’s Risk technology rankings was conducted by Max Chambers.